After World War II, Ferruccio Lamborghini started converting military vehicles into tractors, and began producing his own tractors in 1948. Many questioned his judgment when he decided to build sports cars to compete with Ferrari, but in 1963, he founded Automobili Ferruccio Lamborghini. The 350 GT was the first in a long line of striking designs to wear the charging bull badge, with Lamborghini's own V12 engine and chassis, and coachwork by Touring of Milan. In 1966, Lamborghini produced the first mid-engine supercar, the Miura. It was a barely tamed race car for the road, named for a legendary breed of Spanish fighting bulls. Its 4-liter V12 was mounted transversely behind the cockpit, and its sensational body by Bertone blended aggressiveness and elegance. In 1974, Lamborghini introduced the Countach, an angular, mid-engine supercar that never lost its ability to astonish first-time viewers and drivers. Its successor had to be extreme and spectacular; the Diablo was all that and more, with exotic styling, a 5.7-liter V12, and all-wheel drive. Audi AG acquired Lamborghini in 1998 and replaced the Diablo with the Murciélago in 2001. Aptly named for a famous fighting bull, the Murciélago combines modern sophistication and brute force with a potent 6.2-liter V12 (enlarged to 6.5 liters in the 2006 Murciélago LP640) and all-wheel drive. In 2003, Lamborghini introduced the Gallardo, a high-performance sports car designed for everyday use, with all-wheel drive and a 500 horsepowerV10. 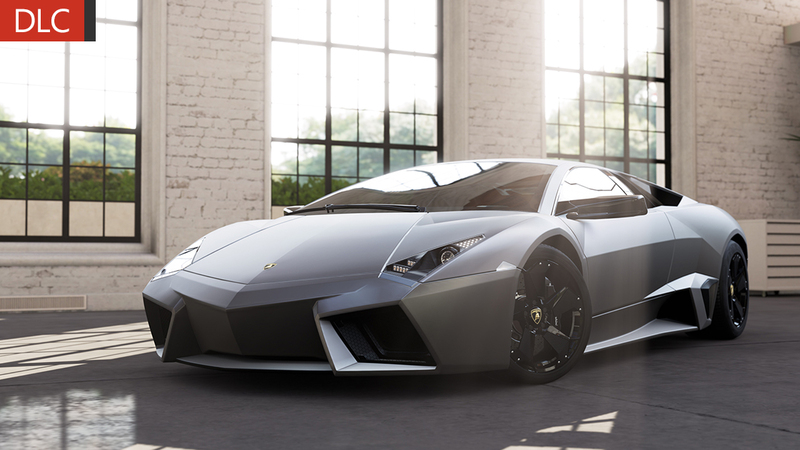 In 2007, the company debuted the Reventón, the most expensive (a million euros) and most exclusive (only twenty were built) Lamborghini to date. In 2009, Lamborghini introduced the Murciélago LP 670-4 SuperVeloce, which boasts a longitudinally mounted 6.5-liter, 670 horsepowerV12. Ferruccio Lamborghini's goal to build cars that compete with the world's best has been fully realized. Forget the Sistine Chapel, this might be the highest form of Italian art. 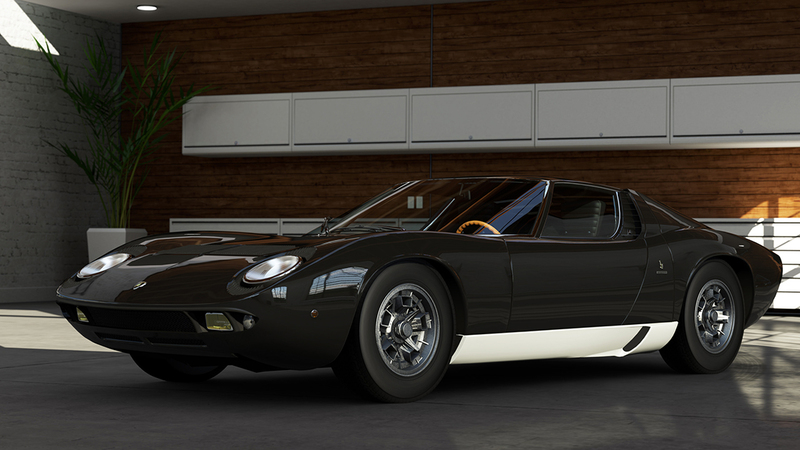 Without the Lamborghini Miura, the term supercar may never have come to be. In an age when the only race-derived designs came from Ferrari, the Miura showed a new direction. The Miura was conceived and designed three of Lambo’s top engineers of the time. The result was a car whose form was revolutionary, and whose performance still thrills car lovers today. If any single car could summarize the entire decade of the 1980s, it’s perhaps the Lamborghini Countach. 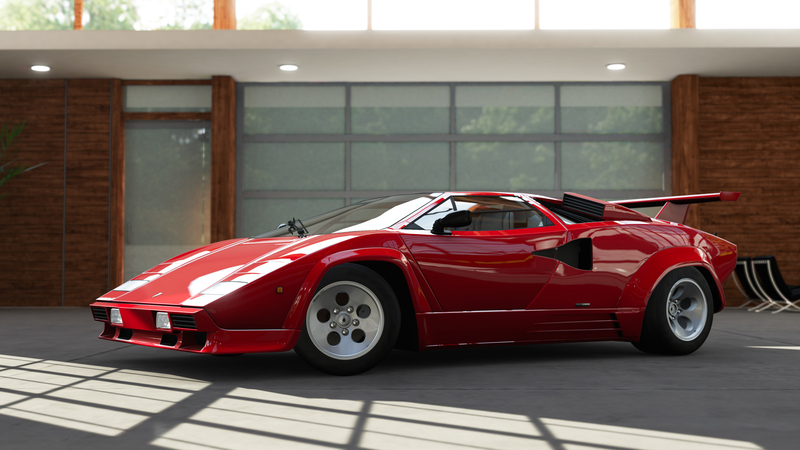 The name Countach comes from the amazed exclamation of styling studio owner Nuccio Bertone on getting a look at the original concept his designer Marcello Gandini had come up with (“countach” is similar to “wow!” in a dialect of Italian), but imagine what he would have said upon catching a glimpse of the much more extreme LP5000 QV. Low, massively wide, and covered in scoops, strakes, and wings, this Countach certainly looks like the most extreme variant of the ultimate 1980s car around. And it’s no poseur, either, as anyone who’s heard the growl of the 5.2-liter V12 can attest to. The “QV” in the name comes from quattrovalvole, referring to the new 4-valve-per-cylinder head that increased output to 455 horsepower, an incredible number for the late ‘80s. So while performance was understandably phenomenal, it’s also the best of the breed. If a quick spin doesn’t instantly convince you of this, perhaps the opinion of long-time Lamborghini official test driver Valentino Balboni will: he considers it to be the ultimate Countach, with the perfect amount of brute force to match the stunning lines of the original hypercar. At first glance, the absurdly low, wide, and aggressive Diablo SV looks like it would be evil to drive, a sort of untamed raging bull looking to buck you into a guardrail at the first opportunity. Also, the “SV” (superveloce, in Italian—very fast, in translation) version doesn’t even come with the all-wheel drive of the “VT” model, so it should be a handful… right? Wrong—the SV is a surprisingly easy car to drive quickly, partially because the stock mammoth rear tires resist breakaway until their very limit. Unlike a lot of other mid-engined supercars, the Diablo gives you some warning before things go pear-shaped. 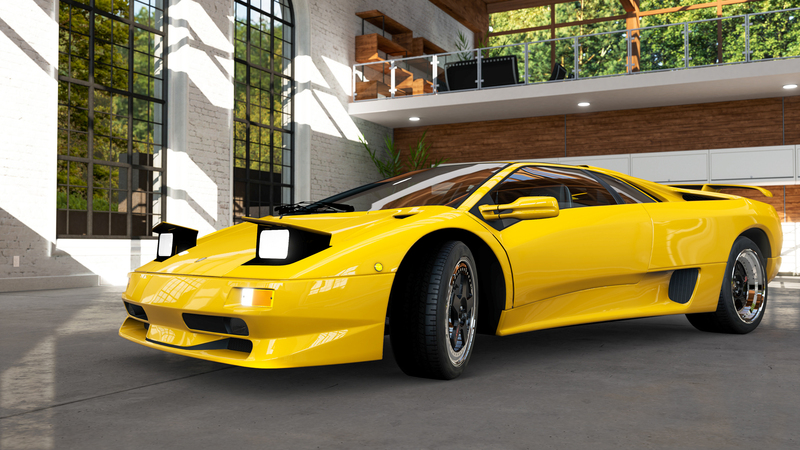 But you shouldn’t be thinking about pears when you look over the Lamborgini’s lines—wedges would be more accurate, because from the nearly horizontal windshield to the kicked-down door line, the Diablo appears in profile almost like a knife-edge. Considerably more restrained from a styling standpoint than its wild ancestor the Countach, the Diablo SV still wears a large rear wing and a pair of roof-mounted hood scoops feeding air to the massive 5.7-liter V12, but it’s a more mature design (although there’s no mistaking it for anything other than a Lamborghini, particularly in a lurid shade of yellow). It’s also a more mature driver, allowing drivers to fully utilize the 520 horsepower on tap without getting into too much trouble. From the jet exhaust-aping hindquarters to the “all-glass” aircraft-style LCD cockpit instrumentation, and from all the knife-edged creasing on the bodywork to the massive centre-exit exhaust, you might think the Lamborghini Reventón is trying to mimic a stealth fighter. 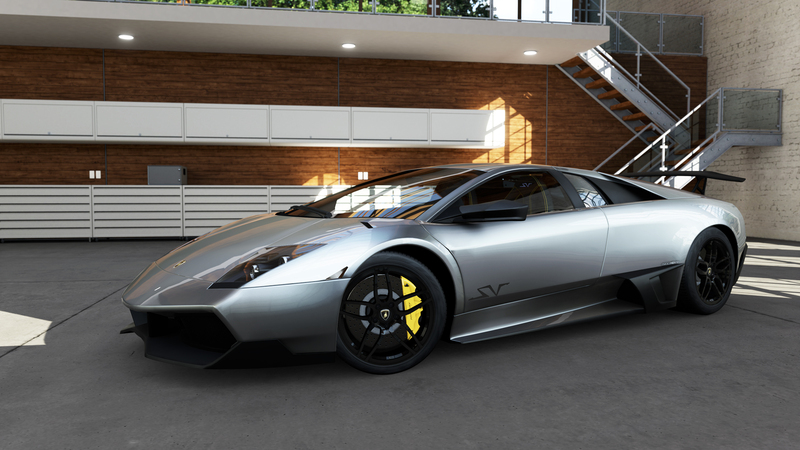 You’d be correct – the direct inspiration for this exclusive Murcielago variant was the F-22A Raptor, an advanced jet with stealth capabilities. But the Reventón is far more exclusive – eight times as many F-22As exist than Reventóns; only 20 would be delivered to Lamborghini’s most prized customers. Constructed almost exclusively in the woven carbon stuff, and sporting a blueprinted version of the Murcielago’s massive 6.5-litre V12, its 211 mph top speed is as close to flying a jet as you can come without leaving the ground. The Murciélago LP 670-4 SV may be a mouthful, but consider it shorthand for one of the fastest Raging Bulls ever to roar out of Lamborghini’s Sant’Agata plant. Fitting, because the “SV” tag stands for SuperVeloce—Italian for “superfast,” and Lamborghini only uses the SV name for the most highly-tuned final edition of a model going out of production. The SV modifications for the Murciélago certainly fit the bill, managing 661 horsepower (the “670” in the name is the metric horsepower rating) from the latest generation of the 40 year-old Lamborghini V12. Of course, nearly every part of the engine has been updated and optimized over its lifespan, which should be apparent as it warbles by at full throttle. In addition, the SV was put on a diet of carbon-fiber, trimming 220 pounds, and adding spoilers and side scoops crafted from bare carbon-fiber. The Murciélago was already a stunner, and the LP 670-4 SV is a fitting send-off to one of the most ferocious supercars to ever wear the bull of Sant’Agata. No mistaking, this is the longest name of any car of all time and it is bestowed upon a ride worthy of such a mouthful. Never before has a Lamborghini taken all-wheel drive and made it so integral, so well managed that you don’t even know it’s there until it’s the only thing holding you to the road. Just being in the presence of an Aventador is enough to make one feel regal. Driving this mad bull can be likened to finding Elvis and winning the lottery… on the same day; thrilling, fortuitous, and maybe a bit surreal. 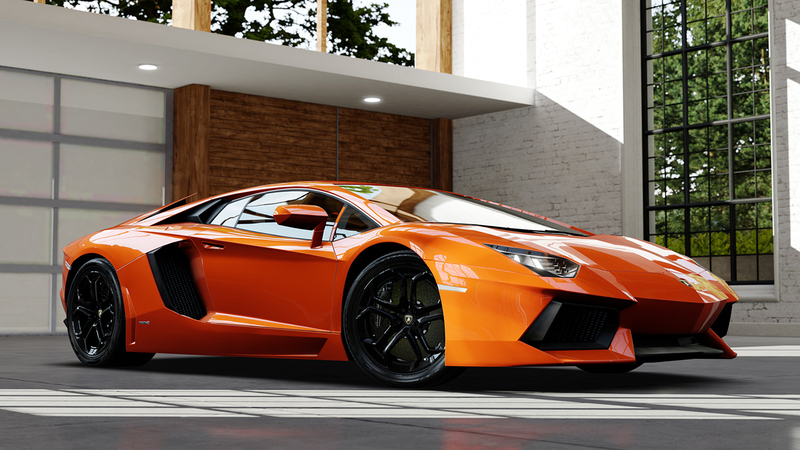 The Aventador exudes sensual power, drop dead beauty, and performance numbers that seem derived from NASA blueprints. This is a bareknuckle brawler of a supercar, brandishing 700 bhp and more than 500 foot/lbs. of torque. In short, the Aventador’s potential is limited less by its engineering than by the bravery of its driver. A departure from traditional Lamborghini styling is represented in the Veneno. Radical bulging lines, a wing that looks like it belongs on an LMP car, and aero on top of more aero; these are just a few of the elements that make the most expensive production car in the world unique. 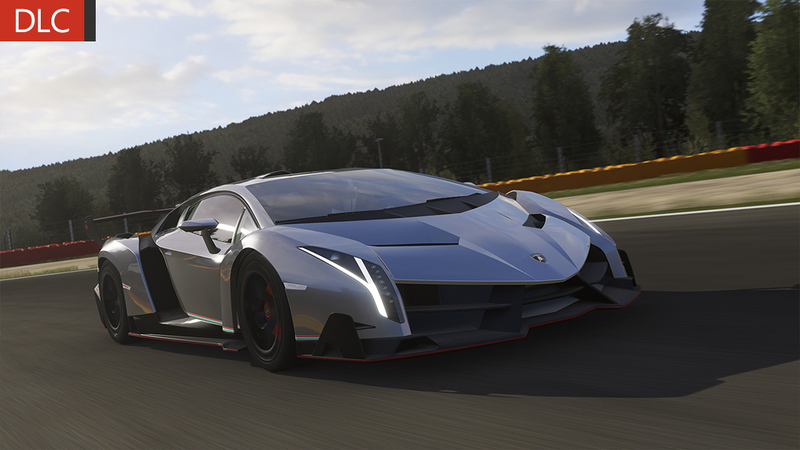 Celebrating the 50th anniversary of Lamborghini, the Veneno is a street-legal racecar, loosely based on the Aventador. We say “loosely,” because not only is the Veneno more powerful and higher-revving, thanks to larger air intakes and a modified exhaust system, but its form is quite obviously its own. Cues have been taken from the Aventador in the Y-shaped headlights and taillights, but the Veneno is much more of a design experiment like the 2006 Miura concept; with a quality that is at once timeless and jaw-dropping in all categories, including that $4.1 million price tag. Lamborghini built one for itself as a demo car, and sold three, each accented with a color from the Italian flag. The red accented car went to to Antoine Dominic, owner of Lamborghini Long Island. The second, with green accents, went to prominent Lamborghini fan Kris Singh. The final model, with white accents, was caught in Hong Kong on its way to Macau. 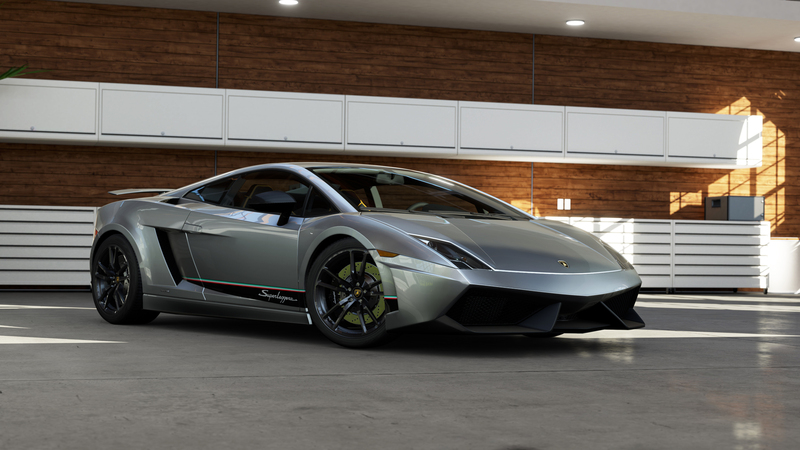 Seeing one in the real world will most likely never happen, so take advantage of Forzavista and get as up close and personal with this stunning masterpiece.